I'm ecstatic about today's post by one of my new contributors! Jeanne did an incredible job capturing her experience at High Point and after reading her post, I feel like I was there myself! I feel so inspired and excited about all of the new trends emerging in the world of design. Did any of you attend? What was a highlight for you? Enjoy! Hello there! This is Jeanne from Cozy•Stylish•Chic . For my first contributor post, Julie asked me to talk about High Point Market, the World's Home for World Furnishings, that takes place twice a year in High Point, North Carolina. I could not be more thrilled, as market was such an incredible experience for me. Never mind the tired and blistered feet. I had a renewed sense of what was going on in the world of interior design, and I returned to LA inspired! 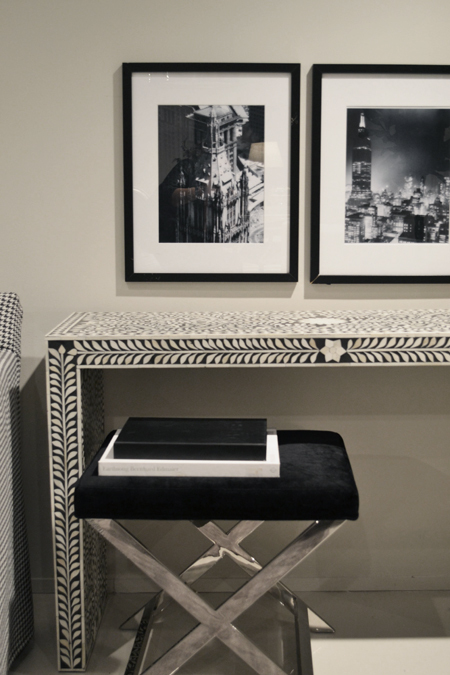 "The energizing power of black and white is not confined to apparel," says Ron Fiore, Bernhardt creative director, "Black and white combinations are easy to live with, grounding, and mix with any palette you've established." This held true not only for Bernhardt, but for the majority of lines I came across. 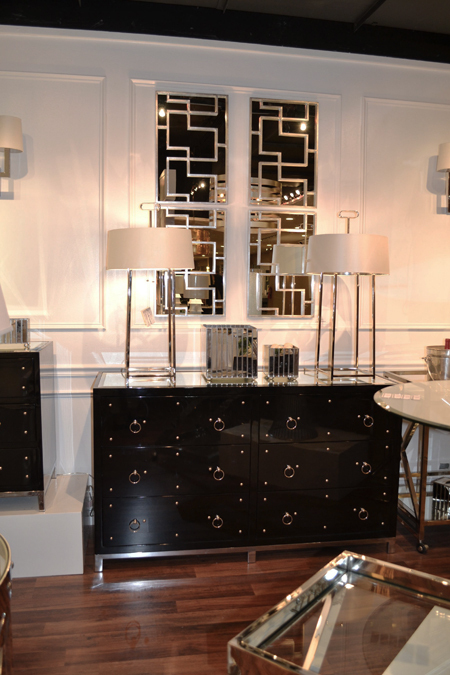 Not only was black and white well represented in the Bernhardt Showroom, but inlay also seemed to make an appearance in each room I walked into. Each inlaid furnishing was intricately detailed and outfitted with a simple, almost architectural base that was equally as stunning as the inlaid detail above but surprisingly did not detract from its beauty. According to C.R. Laine, "Black is back" and there is no in between. 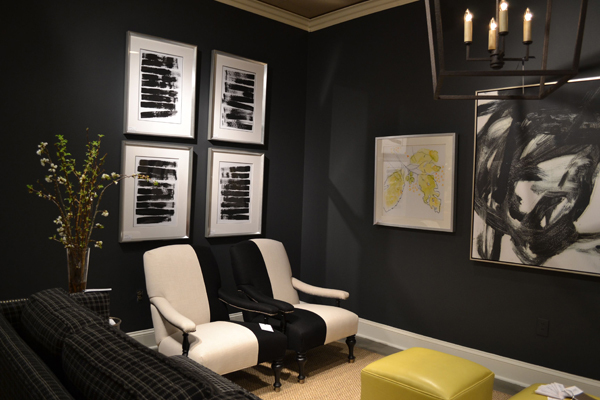 Here, black and white is paired in stark contrast to one another with a little chartreuse accent to add a little bit of pop. 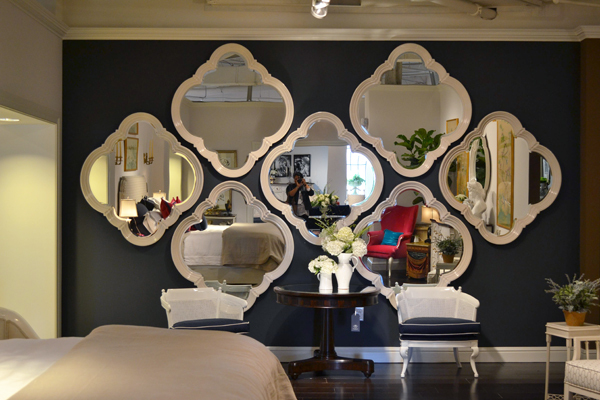 The white lacquered Charleston mirror from Stanley is such a treat when displayed as a group and put against a black background, as seen above. More bone inlay from Bernhardt, but that's a good thing, because I can't get enough of it. 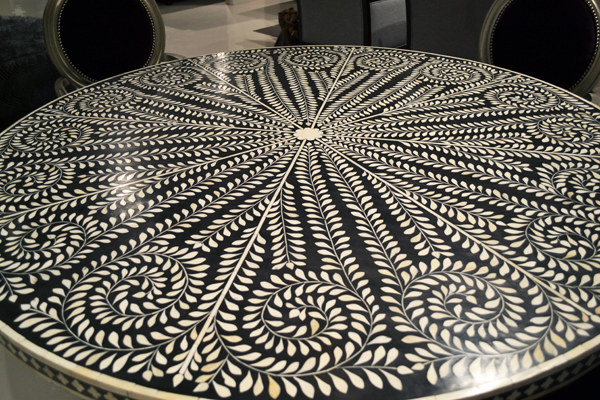 Often seen in ethnic Indian furniture designs, Bernhardt makes bone inlay look contemporary and chic by pairing it with a chrome X-base chair, a herringbone sofa, and black and white photographs on the wall. Glossy black lacquer against white - a glamorous ensemble from Worlds Away. 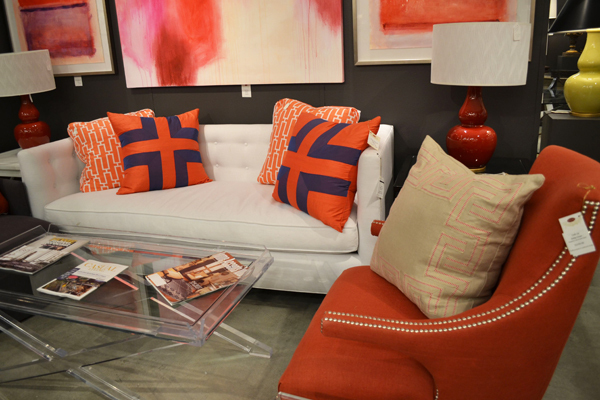 Oranges and corals are used as accents in the home either as an accent chair or with accessories to add a touch of color and vibrance to a room. 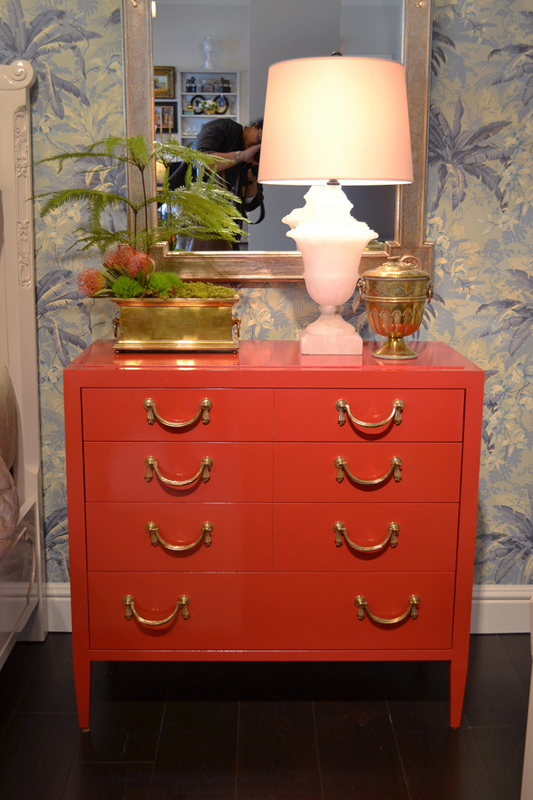 This beautiful coral lacquered bedside table from Stanley Furniture would be equally at home in a traditional setting as it would in a more contemporary or eclectic setting, which is why this is one collection to keep an eye on. Notice how the handles on the bottom drawer are offset - it brings a little whimsy to the table, which I love. Bright, glossy accessories from Studio A - used in conjunction with bone and gold, and other neutrals to give a little pop of color. 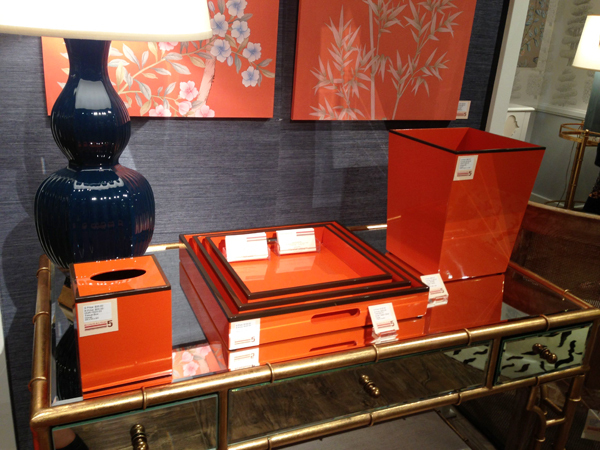 This look from Bernhardt integrates orange accessories into a classic room of browns with brass trim. 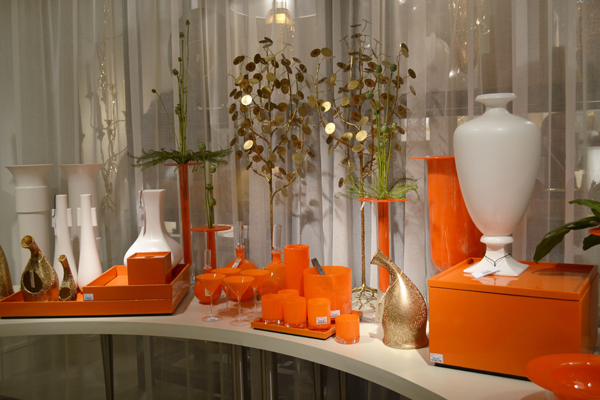 Orange and brown lacquered trays and accessories with a nod to classic Hermès. Tufting Following in the footsteps of the wildly popular tufted Chesterfield, but now incorporating new contemporary styling, color, and materials. The color of this chartreuse ottoman from Kim Salmela Atelier lights up the room with its presence. 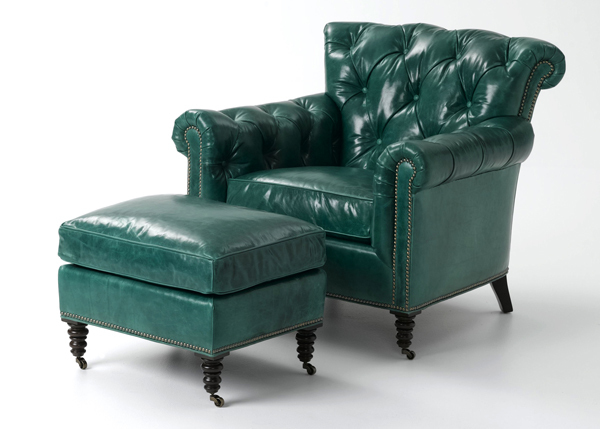 Emerald, Pantone's color of the year gives this traditional shape a contemporary twist. 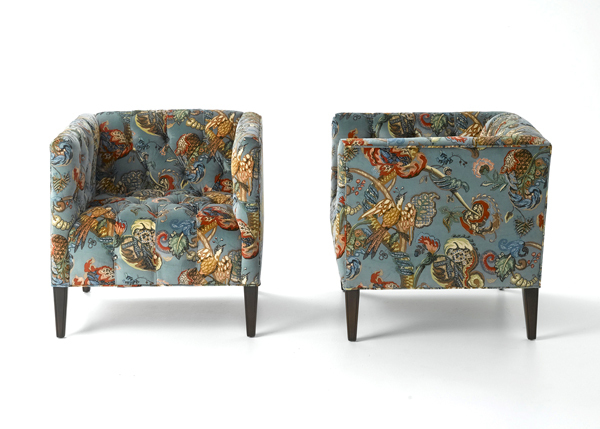 This pair of Martini chairs is from Wesley Hall, and is seen upholstered in "Keyhaven-Vintage", an exclusive print from Ian Sanderson Textiles. 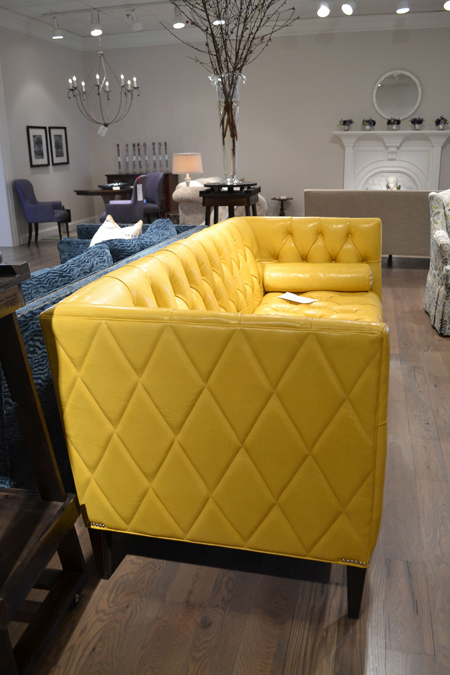 I adore the quilting on the sides and back of this buttery soft leather tufted sofa. Wesley Hall went the extra mile to make this piece a stand out . 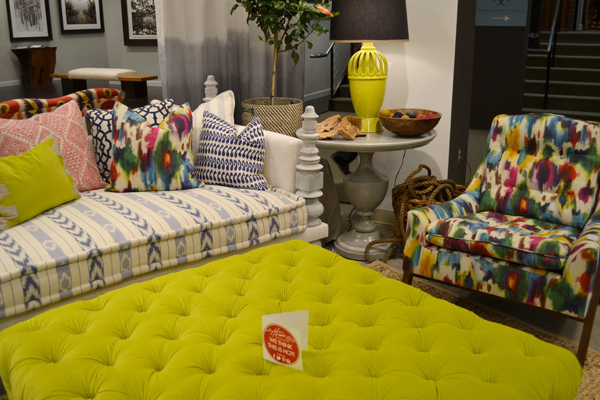 The bright canary yellow color makes sure that this sofa does not go by unnoticed. 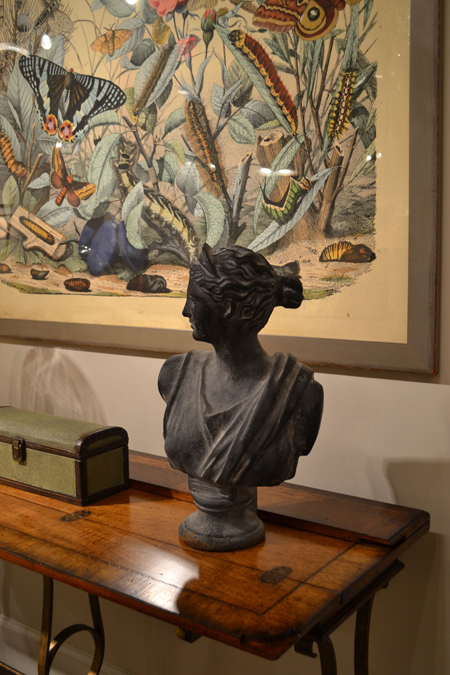 Both two and three dimensional busts and portraits were seen throughout market in a range of styles, time periods, and mediums. 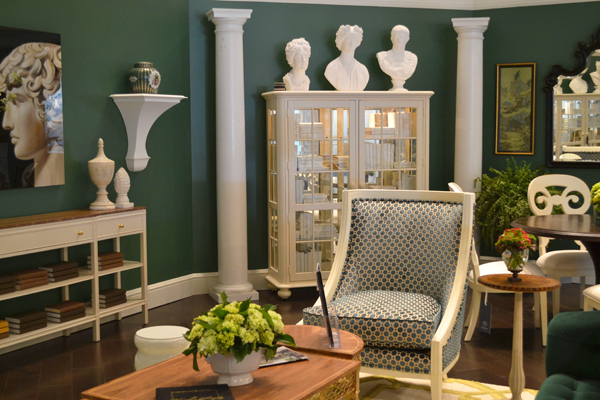 This room in the Stanley Furniture showroom, which pays homage to classical antiquity, was designed by the dynamic design duo, Ron Woodson and Jaime Rummerfield of Woodson and Rummerfield's House of Design. Two photographs of ancient Greek statues are shown on the center wall, in profile and facing one another as though in conversation, and several busts are gingerly placed atop the dressers and armoires that line the perimeter of the room. 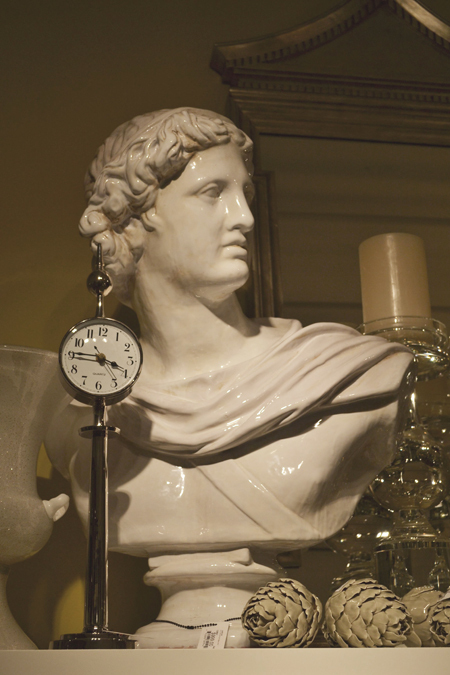 Classical antiquity was definitely on Woodson and Rummerfield's minds when designing this room! 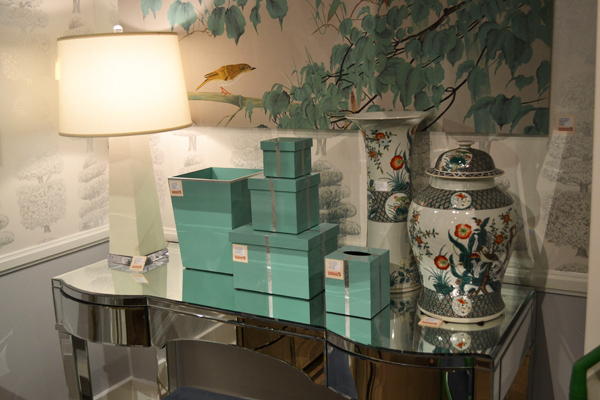 Chinoiserie Chinoiserie has always been a staple of fashionable interior decor. It is a European style which reflects the Chinese artistic influences on the western world. 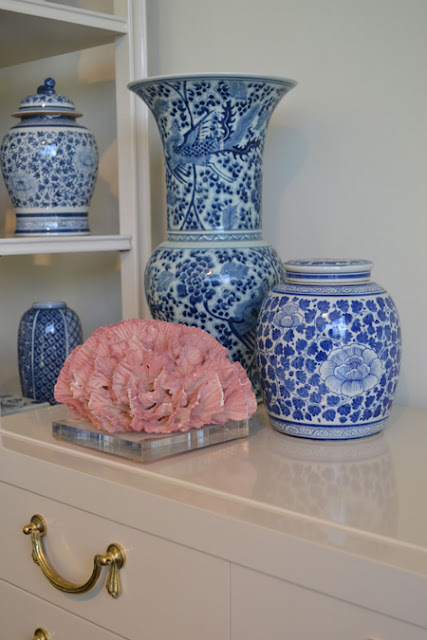 Even though blue and white ginger jars seem to be an ongoing trend for the last 30 years, this season marked a renewed interest in Chinese artistic influences on the west, with styles being pushed to the limit with more flair and sass than before. 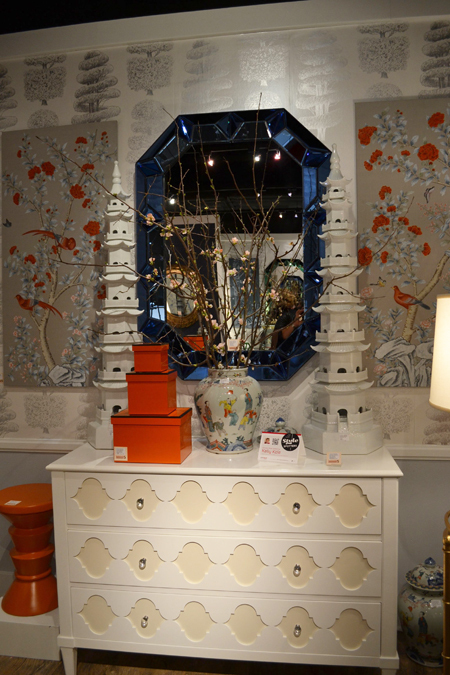 It marked the return of high gloss lacquer, but this time in bright and saturated colors, the presence of pagoda shapes, hand painted wallpaper, and porcelain reproductions, all hallmarks of classic Chinoiserie. 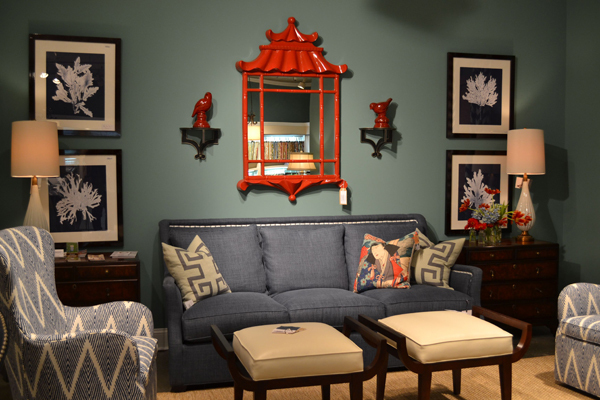 This red lacquered pagoda top mirror and pair of birds seen in the C.R. 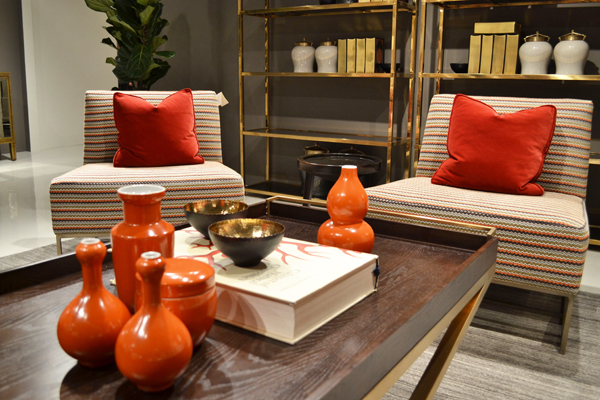 Laine Showroom gives this room that little bit of "oomph" it needs. 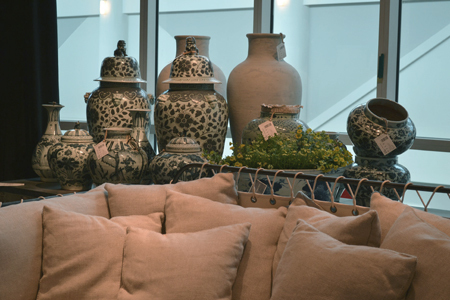 Blue and white ginger jars in a contemporary setting at Four Hands Showroom. Stanley Furniture uses classic blue and white ginger jars to accent pieces from the Charleston Regency collection. Traditional yet at the same time, contemporary. 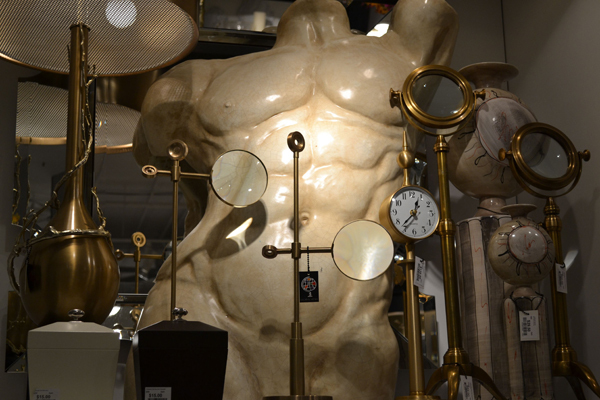 I hope you enjoyed my recap of the trends from High Point Market. If you haven't already, I'm sure you'll start to see these same trends pop up all around you. Until next time, ciao! Unless noted, all images are my own. I love all of the tufting as well! And the black and white - such a timeless trend...it makes me want to do my apartment over in that scheme.